If you have ever seen or heard about the type of diet Michael Phelps follows, you will understand the importance of the diet to a competitive swimmer. Swimming uses up a large number of calories and energy, making it necessary for a swimmer to follow a proper diet to give his body the fuel it needs to have the strength and endurance necessary for competitive swimming. While it is probably not a good idea for anyone to consume the 12,000 calories a day Michael Phelps consumes, it is necessary for swimmers to increase their calories by a few thousand calories per day. The most important components of those calories are carbohydrates and protein, both of which fuel the body to handle the strength and endurance swimming requires. You are probably familiar with carbohydrate loading, which was popular for swimmers in years past. This is not always necessary as long as you follow a proper diet most of the time. Your diet should consist of more than 50 percent healthy carbohydrates. Fruit juices and dairy products can provide you with simple carbohydrates, while whole grains, such as whole grain pasta or bread, and vegetables high in starch, such as potatoes and beans, can provide you with complex carbohydrates. Protein is necessary to build the muscles you need for swimming. Every time you swim or workout, your body breaks down muscle tissue. In order to build that tissue back up, you need to consume protein, which contains the amino acids necessary to repair the torn muscle tissues. Without the proper amount of protein, your body will not repair the tissue fast enough to allow you to swim as competitively as you could. 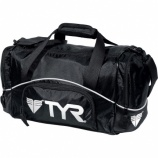 Having a swim bag that can carry snacks will keep you energized at meets and practices. Before you head out to your swim meet, you should pack your swim backpack with all your necessary gear, including food to keep you energized. Keeping a stash of healthy carbohydrates and the proper fluids with you will allow you to properly fuel your body during the few hours before your meet. Finding the right swim bag that will allow you to carry your food, as well as your necessary swim gear, will allow you to be the most successful. Learning the proper diet, along with practice and exercise, will help you have the most successful swim team season. Healthy carbohydrates, protein and fluids are the most important things to fuel your body with before and after your swim team meets and practices.